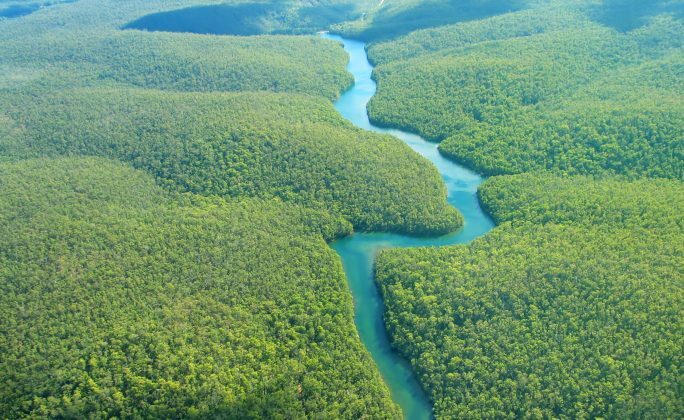 A new study published in the journal Proceedings of the National Academy of Sciences has revealed that a series of mysterious lines and geometric shapes carved into the Amazonian landscape were created thousands of years ago before the rainforest even existed, according to a report in Discovery News. The purpose of the massive earthworks and who created them remains unknown, and scientists are beginning to realise just how much there still is to learn about the prehistoric cultures of the Amazon and life before the arrival of Europeans. The unusual earthworks, which include square, straight, and ring-like ditches, were first uncovered in 1999, after large areas of pristine forest was cleared for cattle grazing. Since then, hundreds of the earthen foundations have been found in a region more than 150 miles across, covering northern Bolivia and Brazil’s Amazonas state. The ditches were sculpted from the clay rich soils of the Amazon and are typically around 30 feet wide and 10 feet deep, alongside 3 feet high walls. However, the largest ring ditches found so far are an incredible 1,000 feet in diameter. The purpose of the ditches remains a complete mystery. The fact that many of them are clustered on a 200 metre high plateau suggests they may have been used for defence, however, others have suggested they were used for drainage or for channelling water since most were placed near spring water source. A team of researchers who published a paper in the journal Antiquity in 2010 argued that the layout of the ditches is highly symbolic suggestion a ceremonial and religious function. Until now, it was believed that the earthworks dated back to around 200 AD. However, the latest study has revealed that they are, in fact, much older. Study author John Francis Carson, a postdoctoral researcher at the University of Reading in the United Kingdom, explained that sediment cores had been taken from two lakes near the major earthwork sites. These sediment cores hold ancient pollen grains and charcoal from long-ago fires, and can reveal information about the climate and ecosystem that existed when the sediment was laid down as far back as 6,000 years ago. The results revealed that the oldest sediments did not come from a rainforest ecosystem at all. Rather, they showed that the landscape, before about 2,000 to 3,000 years ago, looked more like the savannahs of Africa than today’s lush rainforest. The earthworks predate the shift from savannah to rainforest, which reveals that the creators of these ditches carved them before the forest moved in around them. They continued to live in the area as it became forested, probably keeping clear regions around their structures, Carson said. The discovery and dating of the ditches sheds new light on life in the Amazon region thousands of years ago. Previous study have stated that the area could only support small, impermanent village. Instead, it seems likely that the Amazon teemed with complex societies immersed in a rich culture and advanced enough to undertake massive construction projects which would have required a large, co-ordinated labour force. The questions remain as to just how many more earthworks may exist undetected under the remaining forest and what the true extent of their construction work really was. Republished with permission from Ancient Origins. Read the original.